Yikes! We don’t ask where my thoughts blog titles come from, they just appear. Alrighty then, let’s move on shall we? So to follow-up with my previous post on edible shampoo and conditioner, I wanted to tell you a little about the Environmental Working Group (EWG). EWG specializes in providing useful resources (like Skin Deep and the EWG’s Shopper’s Guide to Pesticides™) to consumers while simultaneously pushing for national policy change. WHY? Probably the most dangerous ingredient used in skin and hair-care products, SLS is a powerful detergent and attacks greasy surfaces. Used in 90 per cent of products that foam, including cleansers, shampoos, shower gels and bubble baths. In the cleaning industry SLS is used in garage floor- cleaners, engine degreasers and car-wash soaps. WHY AVOID? Harsh skin irritant that may also result in the formation of potentially carcinogenic nitrates and dioxins. Animals exposed to SLS experience eye-damage, central nervous system depression, laboured breathing, diarrhoea, severe skin irritation and even death. Sounds pretty bad, huh? I think it’s terrible that they put SLS in over 90% of care products. For what good reason? To sicken us even more? No thanks. I usually check my food labels but now I will be more diligent in checking the labels of my every day products as well. EWG has done a ton of research and recently released their Skin Deep® Cosmetics Database which searches over 74,000 products. This is where you can go and see how bad (or good) the stuff you are putting on your face is. They also have a 2012 Sunscreen Report which tells you the best of 1,800 sunscreens and SPF lip balms, moisturizers and makeup. I use Badger on Emma and myself and when I searched it, it came out with an overall score of 1-which is good. The lower the overall score the less toxic it is for you. Um, no thanks, I’ll pass on grass spray sunscreens. Yes, you will probably pay more for the better quality stuff but it will be worth it in the long run when our little ones grow up. Also, you don’t need to use anything over SPF 30. 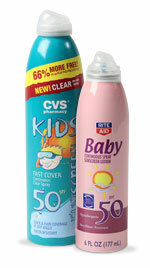 It’s getting a little ridiculous with SPF 100+. Really? Believe it or not 10-15 minutes of natural Vitamin D (at high noon) is healthy for our bodies, especially for those of us with osteopenia. I am so thankful that I live below the 38th parallel so I can get me some good ‘ole sunshine for my inside and out. EWG also has a 2012 Shopper’s Guide to Pesticides complete with a list of the dirty dozen (that need to be organic) and the clean 15 (that can be conventional). I had no idea bell peppers needed to be organic and that sweet potatoes didn’t. Check it out and even print you a copy to keep with you when you go grocery shopping. It really is a great resource and I intend to get lost for several hours educating myself on the good, the bad, and the ugly with what’s out there and in the things I use. I hope you will do the same. Join me on researching the products and food you use every day. Try not to be brainwashed by the media and what celebrities get paid millions for to sell a product that I guarantee they DON’T use. Take charge of your health, along with your family’s, and make sure we are putting the best items inside and outside our bodies.